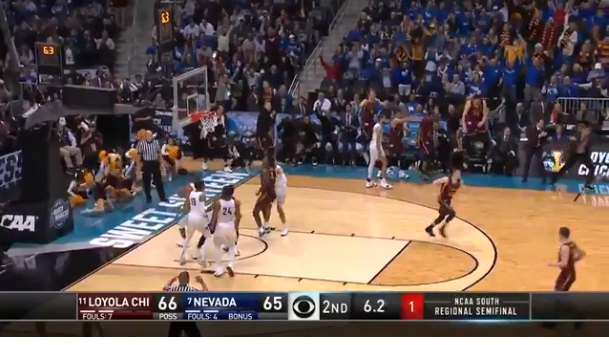 Loyola Chicago Added Volatility to Everyone’s NCAA Pool as Trade Wars Add Vol to Markets. 1.After No Volatility in 2017….Six Sessions of 20% Moves in VIX 2018. Volatility has been extremely, well, volatile this year. 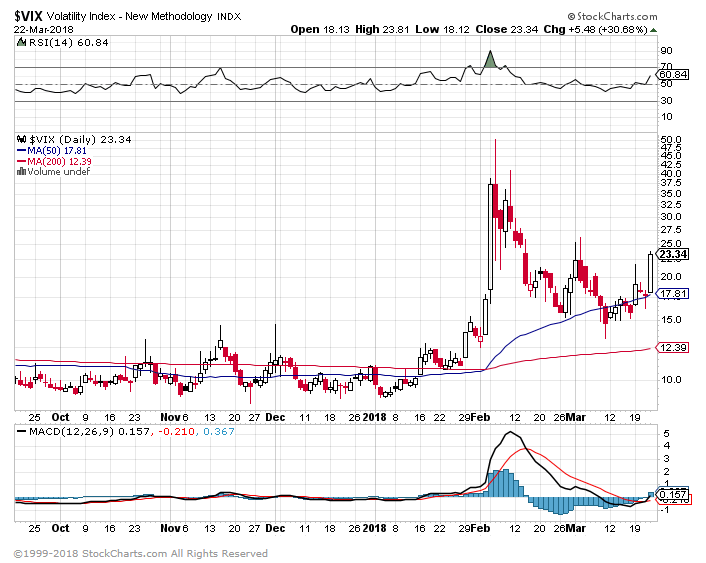 The Cboe Volatility Index VIX, -1.84% has seen multiple days with extremely sharp moves so far in 2018, including on Thursday, when it jumped 30.7% to 23.35. According to data from the WSJ Market Data Group, the so-called “fear index” has experienced six sessions this year that saw a jumped of least 20%, along with one day that saw a 20% drop. Notably, volatility more than doubled on Feb. 5, amid the start of a steep selloff in the U.S. stock market spurred by inflation concerns. The tally of seven sessions stand as the most one-day 20% moves in a calendar year since 2014, when there were also seven throughout the entire year. Looking solely at the six 20% increases, the total is the most for a calendar year since 2015, when there were also six. 2.Gold Not Doing Much on These Sell Offs. 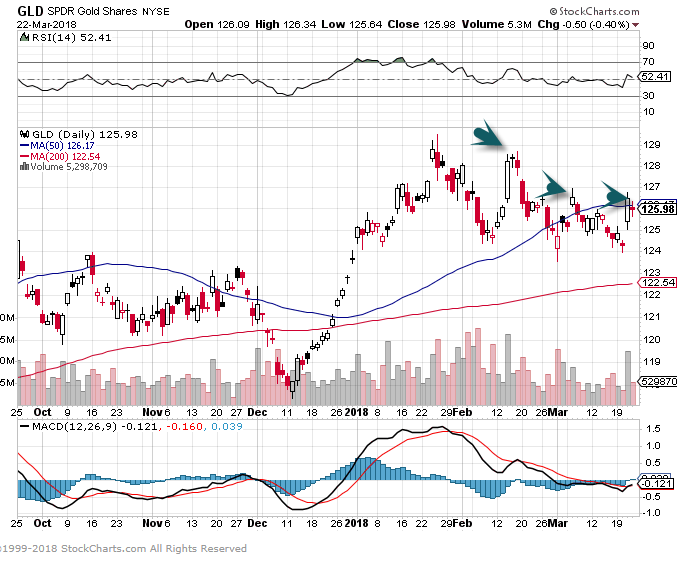 3 Lower Highs in Feb/Mar for Gold. 3.Tariffs Positive Small Cap vs. Large Cap. One area of the market that has seen a big boost with all the tariff talk is small caps. Despite Trump’s “America First” policies and rhetoric, the Russell 2000 has underperformed the S&P 500 over the course of President Trump’s time in office. 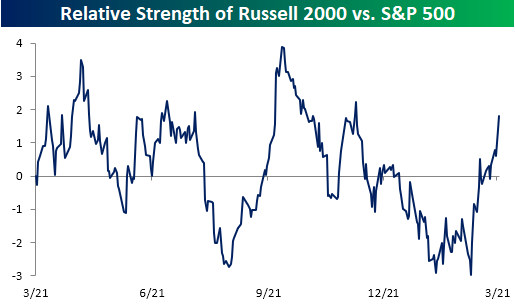 Ever since the President brought up the issue of tariffs, though, the Russell has rallied and is now up 3% in March compared to a 2% decline in the S&P 500. 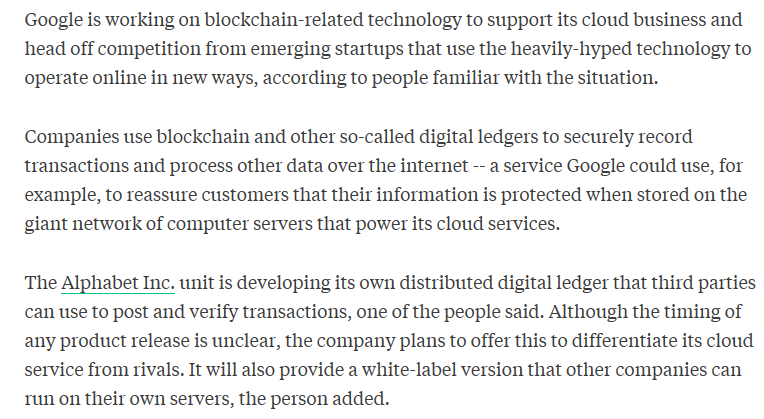 4.Big Cap Tech Working on Blockchain. When Alphabet wants to keep up with emerging technology, it often backs startups in the field and makes small acquisitions to recruit talent. 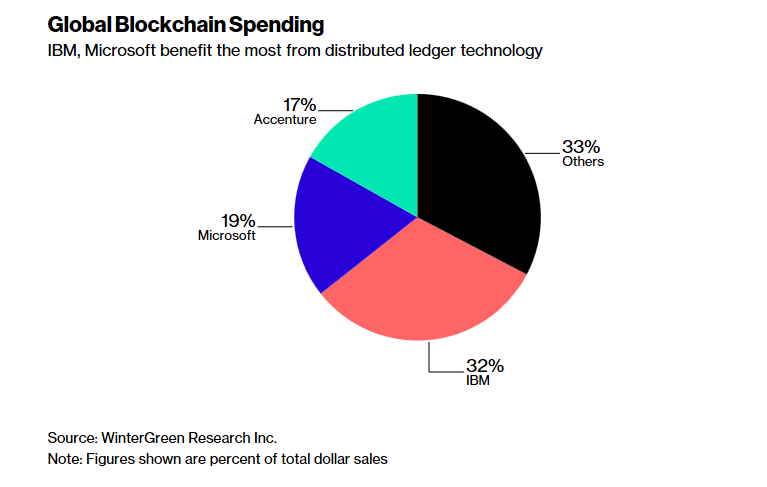 GV, Alphabet’s venture capital arm, has invested in wallet service Blockchain Luxembourg, financial transactions network Ripple, cryptocurrency asset management platform LedgerX, international payments provider Veem and the now-defunct Buttercoin, according to CB Insights. 5.World’s Best Known Economists Get into Crypto….World’s Best Known Economists Also Ran a Little Firm Named Long Term Capital Management. SMART CRYPTO– Some of the world’s best-known economists will on Thursday announce plans to create what could be described as the academic’s cryptocurrency, dubbed “Saga” – Saga aims to address many of the criticisms that are frequently thrown at bitcoin, the world’s biggest cryptocurrency, to position itself as an alternative digital currency that is more acceptable to the financial and political establishment. It is being launched by a Swiss foundation with an advisory board featuring Jacob Frenkel, chairman of JPMorgan Chase International and ex-governor of the Bank of Israel; Myron Scholes, the Nobel Prize-winning economist; and Dan Galai, co-creator of the Vix volatility index – The currency aims to avoid the wild price swings of many cryptocurrencies by tethering itself to reserves deposited in a basket of fiat currencies at commercial banks. Holders of Saga will be able to claim their money back by cashing in the cryptocurrency. In case you missed it, Chief Investment Strategist Alexander Green previewed his keynote speech in Investment U. This week, I want to share my take on the subject of investing versus speculation. “Speculation” has an image problem. In 2012, Vanguard founder and index fund pioneer John Bogle published The Clash of the Cultures: Investment vs. Speculation. The book’s recommendation? Don’t speculate… invest only in index funds. Bogle also trashed newfangled exchange-traded funds (ETFs). Why? Because you can trade ETFs as easily as stocks… and that ability encourages speculation. I believe both investing and speculation have their place in managing your portfolio. But you have to be very disciplined in your approach. “Investing” is buying shares in a company for long-term financial returns. “Speculation” is trading financial instruments of all types with the hope of substantial short-term gains. You’ll find dozens of books on how to invest like Warren Buffett. Yet you’ll find fewer books on how to speculate like George Soros. Soros’ 1987 book on speculation – The Alchemy of Finance – is virtually unreadable. And the single most famous book on speculation – Edwin Lefèvre’s Reminiscences of a Stock Operator – was published in 1923. You can study investing in business schools around the world, but I have yet to hear of a business school that offers a course on financial speculation. This implies that investing is noble and speculation is shady – that’s misguided at best… and condescending at worst. I think you can simultaneously be an investor and a speculator – and be profitable doing both. Secret No. 1: Financial theory is irrelevant. Business schools teach modern finance and efficient market theory to explain the rhyme and reason of daily stock market gyrations. Economists and psychologists have even collected a few Nobel Prizes for their efforts. Yet the high priests of modern finance have been remarkably unsuccessful at explaining why the market does what it does. In October 1987, a reporter asked him to explain the stock market crash. His secret is his willingness to admit – and correct – his mistakes. Secret No. 2: Risk control is critical. Managing risk is the real secret behind winning – and staying – in the speculation game. Kovner’s primary focus is on what could go wrong. When former Soros fund manager Victor Niederhoffer ignored these lessons, he blew up his investment firm… twice. He ended up in so much debt that creditors ultimately took the furniture from his house. Secret No. 3: Size matters. The size of your investment, or “bet,” is the single most crucial key to surviving – and profiting – as a speculator. A poker player knows this intrinsically. If he’s dealt a bad hand, he throws his cards away quickly. If he gets a good hand, he ups his bet. No wonder poker players often make terrific traders. The impact of bet size is hard to quantify – but it is massive. 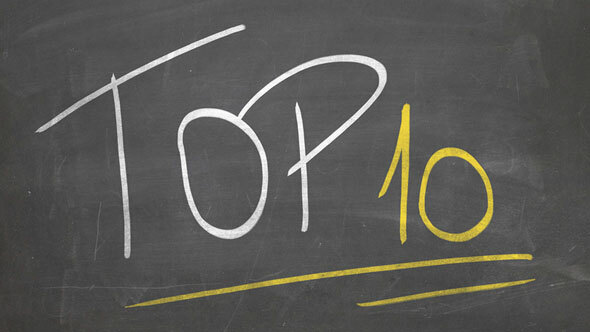 Trading coach Van Tharp writes that bet size accounts for 60% of your trading success. Exits account for 30%. What you bet on accounts for merely 10%. You can see the importance of bet size in Soros’ biggest trading successes. Just before September 16, 1992, the day he “broke the Bank of England,” Soros famously chided his deputy Stan Druckenmiller for the small bet he made against the British pound. Thanks to Soros, Druckenmiller upped his bet and made $1 billion in a single day in one of the most iconic financial trades ever. I’ll return with the remaining four secrets of successful speculation in Thursday’s issue… stay tuned. We who strive for more can learn from the great athlete, no matter our field. The greatest lesson we can learn from the achievement of Roger Bannister, who broke the 4-minute mile in 1954 and who died at 88 yesterday, arises from someone else breaking his record only seven weeks later. And then many times since. Because as great as his physical feat, it shows that his mental feat was as great. Seven weeks isn’t enough time for others to change training, strategy, diet, and so on. They already had the physical ability to break four minutes. Once he showed them they could, they did. That’s leadership: to show people what they can do and enable them to do it. We can learn plenty from him. To our community of leaders, entrepreneurs, and people who take initiative and responsibility, I suggest the greatest lesson we can learn from him is how to learn to overcome our internal barriers. Lead a team to triumph? Sell more to more satisfied customers? Bannister’s feat, followed by many others following suit, shows us that if someone else can, so can you. Bannister was no more or less human than the more-than-1,000 men (and high school boys) who matched or beat his feat. Or the countless men before him who could have beaten the time but didn’t. Running may require some physical luck, but rarely do such requirements exist in business. Warren Buffet’s success hardly depends on his physical self. Bannister himself narrates his run in the video below. Note how much he talks about emotions, feelings, and motivation as compared to his physical experience. By the way, the picture at the top of this article shows Bannister coming in 4th place in a race before he set the record. His disappointment at his result motivated him to prepare for the historic sub-4-minute mile. Contrary to cultural undercurrents, sports participation and academic success are not mutually exclusive. The education attainable through sports can be incredibly valuable in other arenas of life. Unlike traditional classroom learning with lectures, case studies, and analytical papers, or common practices of watching TED talks and reading books, athletes learn by practicing, rehearsing, and doing. Want to improve at a behavioral activity? Whatever it is, you’ll improve through practice, rehearsal, iteration, and other forms of active doing more than passive reading and writing. Reading and writing won’t hurt, but if they take time from practicing, they’ll keep you from your potential. The real secret is that I’ve worked hard.